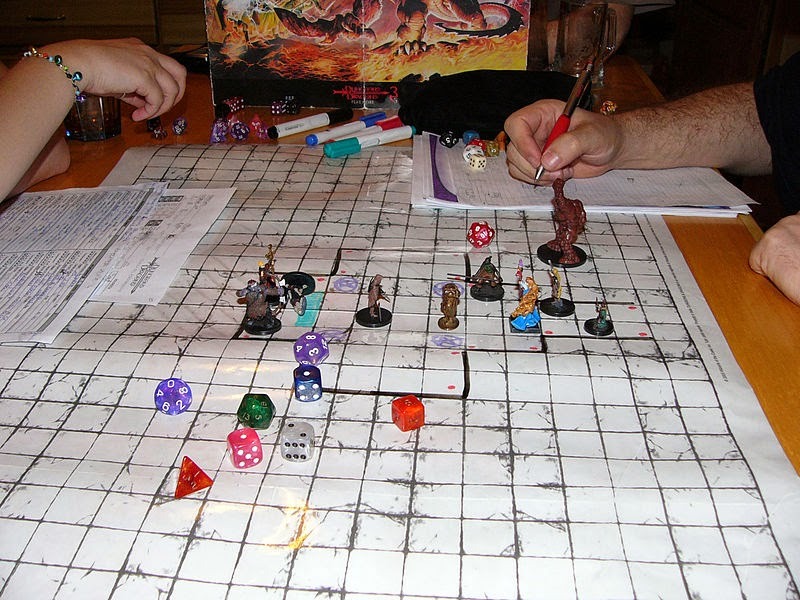 You probably know by now, I play Dungeons and Dragons and other tabletop, dice-rolling RPGs, such as d20 Modern and some GURPS (generic urban role playing system). Although the game mechanics between these game systems are different, the general idea is the same: have character. Sit with a bunch of geeky people (preferably that you like) and hang out being generally silly together, usually with food at hand. It's a pretty sweet setup. And it's taught me a lot about character design. Take backstory. "Backstory," if you haven't heard the term, is the story of your character's life before the game started. Sometimes it's as simple as "She's a dwarf locksmith who never quite fit in, having engaged in the occasional session of off-duty lock picking, and was chased out of the caves, and now is wandering the world trying to find something to do." But in either case, across all tabletop RPGs, I've noticed a theme: After sharing the background with the game master, you rarely share more than a line or two about your backstory for the first adventure, sometimes even for the whole game. And sometimes not even a line or two. In the best campaigns, the game master will work at least a piece of your backstory into the main story. Your character's background will actually matter, in some way. But until it happens, you're not likely to talk about your character's background with the others during general play, except during a conflict. You'll certainly not introduce your character by what he or she did before the game started. And the story of the game rarely suffers for this. What can writers and storytellers take away from this? Stories don't need extensive background brought up until conflict makes it relevant. What you need is to introduce your characters' abilities (with no more background than is needed to understand the abilities). You need introduce your characters to each other and establish how they interact (through dialogue, both verbal and nonverbal). And you need to introduce enough of the setting that the reader understands what is going on--the setting, if it's an unusual world or area, is in a way much like a character. To discover more about your characters, conflict needs to arise. For an important conflict, dropping hints through an early nonviolent/low-stakes conflict introduces a hint of the backstory. Later, a larger conflict brings the details out in force. But only when it's relevant is backstory most effective. I've played games with 20+ pages of background information on the character, and no one but the game master ever read or heard of any of it, because the focus of story revolves around the most interesting character conflicts. If one character is related to the bad guy, then that character's story will be the best known, and at the end of the game, we'll all know the entire relationship, from childhood abandonment to being raised by wolves. Meanwhile, the rest of us will share sparse details--kicked out because I picked one too many locks off-duty; sent to destroy evil by my temple; ex-soldier looking for work now that the army's been disbanded. Maybe a few references to old friends and advice picked up on the way (had a brother-at-arms who was eaten by a wolf that summer of battle. We all starting using wolf repellent, and not another one of us was eaten), but they're situation-appropriate, and more about building character and making interactions more amusing than elaborating on actual backstory. And you know, most players are usually all fine with this. Because the story is where the conflict is, and the adventure is where the conflict is, and as long as we're all having fun and interacting, where we were before the story doesn't matter. The game is in the interaction between people. Not in what goes on before the story begins. There are games where there ends up being one main protagonist. Other times, every character is equally important, and everyone winds up knowing everyone else's background. But that's determined by the conflicts. And the most interesting stories? They're the ones with the most interesting conflicts. So whenever possible, introduce backstory through conflict. You need some context, but once the foundations are laid, make backstory sparse and relevant. Because what the readers want isn't what happened before the story began--what they want is what happens during the story.